Why would I like my PDF to be fillable? Is there anything I should know about fillable forms before I order? What services and solutions do You offer?How can I start using your service? How can you protect PDF-documents? Are there any System Requirements to use your services? What can you do with PDF? What can you do with PDF on a website? What can you do with PDF distributed on a CD? What can you do with PDF on the internal web server? How much does it cost to have a fillable PDF made? 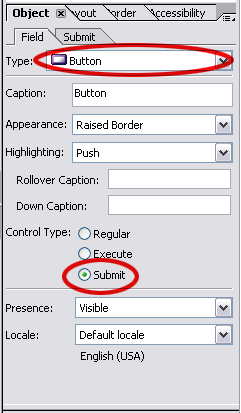 How can I customize form submission? PDF is a document in the Portable Document Format, the format created by Adobe Inc to allow an easy exchange of documents. PDF describes a page in the non-device specific method, meaning PDF will appear the same on any device. What you see on the screen in Adobe Acrobat or Adobe Reader is the same thing that will be printed out, within the limits of your printer. PDFs can be either fillable or non-fillable. A fillable PDF is PDF that contains fillable form fields. Someone using either the full version of Acrobat Professional 5.0 (or higher) must add text fields, buttons etc. Once PDF has fillable form fields, anyone using Adobe Reader, Adobe Approval, or Adobe Acrobat will be able to fill it out with information. Some products have various limitations on how that information can be used beyond that point. A fillable PDF has many advantages. An example of the fillable PDF can be seen by going to the IRS fillable 1040 form. A form filled out electronically looks more professional than a form printed out from a computer and then filled in by hand. It is easier to read and to use, has the ability to enforce standards, and prevents some mistyping errors. PDF is the only form among a variety of types that can be made electronically. Moreover, it always displays the same information, no matter what output device is used. This advantage is not something shared with CGI/HTML forms, XML forms and other document formats that vary greatly from computer to computer or printer to printer, and can cause confusion if the information ever ends up being sent to you in a printed format. In addition, a fillable form can be returned to you electronically, which means you would not have to process paper work. It can be sent to you electronically over the web in the CGI form, as an FDF file, or as a text file on email. These data can then be processed in a database, sometimes without any human intervention. For a company trying to move to a paperless environment, or a new startup company trying to reduce paper storage space and limit dependency on paper, an electronic fillable form would be almost a necessity. The short answer to this question is Yes. First and foremost, you should know what you want your fillable form to do, and how you expect it to look like. If you send us a request, and what you get back matches your request, but is not what you wanted, correcting it will be an additional cost, so try to be as clear and concise as possible in your request. Answering the requests that are sent to us is often more art than science, and we do our best to make them look as nice as we can. Sometimes, our sense of artistic flair doesn't match yours. We understand this, so the specifics of your request will be treated with care by our staff. Requests that only alter style, such as underlining fields or making particular fields line up, don't affect cost, but please contact us before sending the request to make sure the specifics of your request do not extend into what would be a charge. Otherwise, there can be a delay, as we have to send an additional bill to you if the request ends up affecting the price. Form flattening is the term that is used to refer to the process of removing form-field code from a PDF file after a form field has been completed with text or graphics. What services and solutions do you offer? However, we also provide a number of other consultation services related to PDFs. If you have any questions about making PDFs, or have a PDF you would like to be made with any kind of special features, please, contact us, and we will get back to you with information about how much it would cost to get an answer to the question you ask, or to make the PDF with the specifications you request, and we will provide you with the best possible solution. You can try our services free without registration, but if you want to use the service and store your projects, you will need to sign up, visit our Shop, make a subscription and pay for the service. If you face difficulties while starting using a service, Guide page will give you a step-by-step instruction. NextPDF Online Encryption service allows you to manage the security of your PDF-documents. You can prevent your information from copying and distributing. The service can be used to encrypt PDF files with "owner" password, preventing the file from editing (changing), printing, selecting text and graphics (and copying them into the clipboard), or adding/changing annotations and form fields. Besides, you can forbid PDF printing, saving, limit PDF viewing by date and number of views. Prevent PDF files from being printed, changed, copied, extracted, signed, filled, assembled and/or merged! It is a fast and affordable way to encrypt many PDF files simply by few clicks! You need to have Acrobat Reader (5.0 or higher) and IE (6.0 or higher or other compatible browser) installed. You do not need Adobe Acrobat to run the services! The most common uses of a fillable PDF will to put it on a website or on an internal web-server within your company, or to distribute it on a CD or by email. Then you can collect data from users in different ways. But these are not the only uses of a fillable PDF. PDF can be applied to make documents from a ticket-size to a novel-length. It is an almost limitless format. If you have an idea and are not sure how to make it work, email us and we will tell you whether we think PDF would be a good way to make it work, the advantages PDF would have, and whether we can think of any other ways to make the same thing in another format if PDF is not an appropriate choice for you. PDFs on the web are getting more and more popular every day. Many companies are putting their forms up on a website so that people can print them out and return then via mail. While this is a good way to use PDFs on websites, it is not the only, or even always the best way to use PDFs. If a PDF is on a website, then it could also be made fillable, and then people could fill it out directly on their web browser without having to print it out first, the text would be easier to read, as well as format according to your standards. If the server is set up to receive CGI information and process it in a database, then you can have the information in PDF returned to your website in electronic form. If you want to avoid using too much paper, but want to have the data returned to you electronically instead of mailed through the postal system, either for an instant response or for a paperless office setup, a fillable PDF is an excellent way to accomplish this. The data can be returned to you either in a text format, or in FDF that will automatically display exactly what the customers have entered into their form fields. If you have a database with information you want to display in a predefined format so that people can print it, and your database is able to output XML, then that XML data can be formatted to a XFDF file, which will open a PDF form from your website, with the information from the database displayed. These are just a few examples of what can be done with PDF on a website. We can help you to choose proper technique for using PDF Forms on internet, email us and we will tell you whether PDF will do what you are looking for. What can you do with PDF distributed on CD? PDFs have the advantages to appear always the same no matter what device they are displayed on, and being cross platform compatible. This means you can distribute is on one CD that can be accessed by users of Apple Macintosh computers, IBM PC computers running Windows, and servers running Solaris or Linux, and be sure that all these people are seeing as nearly to what you saw when you made it as their displays are capable of showing. The obvious use many people could easily apply it to would be creating a catalog. The catalog could then be sent out on a CD in PDF format. This aspect of the PDF creation would be most easily accomplished by making the catalog in another application and then using either the Acrobat Software, or by submitting it to Adobe's online service for making PDFs. Then, once you have made the catalog, you would like people to be able to order things, so you could send the order form for your products along with the catalog. This way you can make the process of ordering your products easier. Also, rather than spending money on printing an entire catalog, you are able to distribute this information on a CD. Obviously, the two items could be combined, making a customizable catalog or a catalog that automatically fills out a request form. Setting such a thing up would probably be more expensive, but the results would be spectacular and extremely easy for your customers to use. What can you do with PDF on an internal web server? Anything you can do with PDF on the web, you can also do on a local web-server, in particular a company internal workflow of digitally-signed and password-protected documents, e.g. time cards, order tracking etc. One key advantage to PDFs on a local server over other formats like asp or html is that the information in a PDF format can be printed for paper storage or delivery, or can be kept purely electronic, and will look exactly the same no matter which form the resulting information is in. 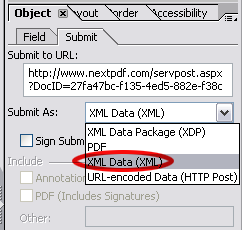 Go to Submit bookmark, enter submit URL and in ‘Submit As’ dropdown list choose XML Data (XML) option. Save your form.